﻿ Thank you to the Dr. Joseph W. Foote Youth Football Clinic! Thank you to the Dr. Joseph W. Foote Youth Football Clinic! THANK YOU to the Dr. Joseph W. Foote Memorial Youth Football Clinic!!!! The 9th Annual Dr. Joseph W. Foote Memorial Youth Football Clinic was held in May of 2017. 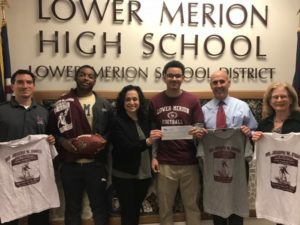 All proceeds from the clinic were donated the Lower Merion Township Scholarship Fund. Thank you to the Foote family, Mary Brown, and the LMHS Football team for your continued support! Over the past 9 years, the LMTSF has received nearly $10,000 in donations as the benefactor of this wonderful athletic program. The next Foote Youth Football Clinic will take place May 20, 2018.